At an elevation of over 11,000 feet, the Grand Mesa is one of the largest flat-top mountains in the world. Year-round activities abound in the region, from skiing and snowmobiling to hiking, biking, and fishing in dozens of lakes. 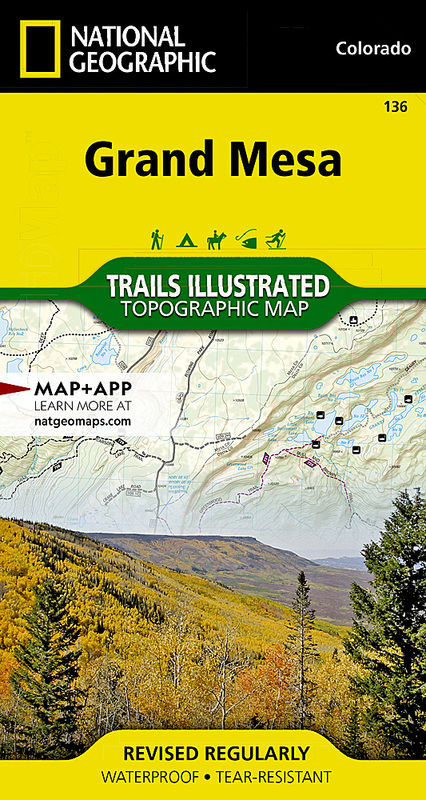 Expertly researched and created in partnership with local land management agencies, National Geographic's Trails Illustrated map of Grand Mesa provides an unparalleled tool for exploring this magnificent region. Key areas of interest featured on this map include Vega State Park, Powderhorn Ski Area, Mesa Lakes Resort, Flowing Park Reservoir, and the Grand Mesa Scenic Byway. With miles of mapped trails including the Crag Crest National Recreation Trail, this map can guide you off the beaten path and back again in some of the most breathtaking scenery in the region. Trail use is clearly marked and hard surface and mountain bike trails are differentiated as well. The map base includes contour lines and elevations for summits and passes. Many recreation features are noted including campgrounds, trailheads, picnic areas, interpretive trails, boat launches, and fishing areas. Other features found on this map include: Grand Mesa, Grand Mesa National Forest, Indian Point.